Center for Racial Justice in Education offers trainings, consultation and in-depth partnerships to educators, schools and educational organizations who want to advance racial justice. Because children don’t only learn in one place, Center for Racial Justice in Education works with educators of all kinds—from classroom teachers and principals to teaching artists and parents. This version of Talking about Race is customized for parents, guardians and caregivers to explore strategies for addressing race and racism with their children. Participants learn how children see race, gain skills for approaching age-appropriate conversations with a racial equity lens, and practice strategies to promote positive racial identity development in children. The follow-up trainings below are open to any Dallas-Fort Worth educator who has participated in a 6-hour“Talking about Race in the Classroom” training with Center for Racial Justice in Education. We look forward to building our anti-racism practice together. 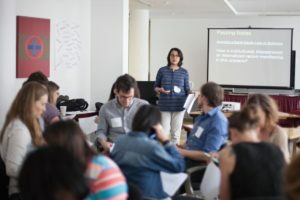 Addressing Racial Microaggressions: Participants will analyze scenarios using a race equity lens and explore strategies for addressing racial microaggression in the moment by engaging in active role-playing. Racial Identity Development: Through interactive activities and dialogue, participants will explore their own racial identity development and how it impacts their work in schools. Addressing Unconscious Bias: Through this training, educators explore the impact of unconscious bias on the academic and social emotional development of students. Educators gain tools to recognize and address their own racial biases, and learn how these biases affect their teaching methods. Creating Racially Equitable Schools: This training explores strategies for building educational institutions grounded in racial justice. Teams spend time assessing the degree to which institutional culture, structures, policies and educational practices reflect principles of racial justice and equity. For more information on our long-term work with schools and educational institutions, please visit Partnerships and Initiatives.